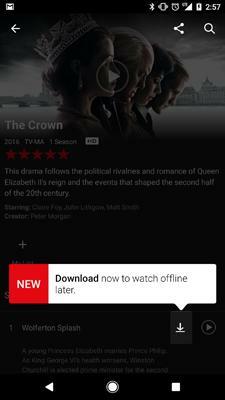 Netflix has added an offline viewing option to the iOS and Android versions of the Netflix app. This allows users to download copies of select movies and TV shows to watch when a network connection is not available. Offline viewing is available to all subscribers, regardleass of plan level. The first group of titles includes Orange Is the New Black, Narcos, and The Crown. While many members enjoy watching Netflix at home, we've often heard they also want to continue their Stranger Things binge while on airplanes and other places where Internet is expensive or limited. Just click the download button on the details page for a film or TV series, and you can watch it later without an internet connection. • Netflix Plans More HDR/Dolby Vision Content in 2016 at HomeTheaterReview.com.